Soon we'll be getting a 2016 Rav4 brand new. Looking to upgrade the sound system. The budget is $12,000. 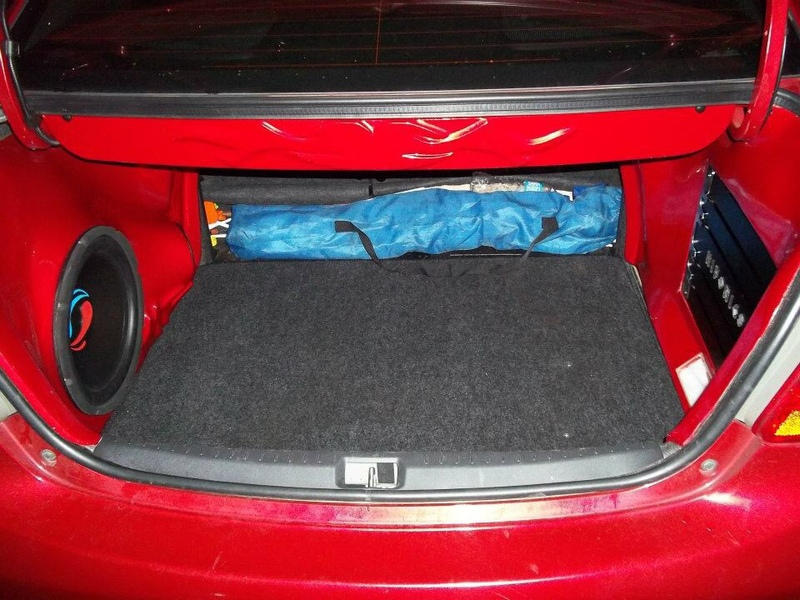 Subwoofer/subwoofers MUST be in a fiberglass enclosure because we need the trunk space. (1) Power Acoustik 2 farad capacitor. 4 channel amp above would run each speaker at 2 ohms and mono power that sundown at 1 ohm. It looks like a dream system that isn't too complicated on paper. I wanted this professionally installed. However I'm worried about the cost. The Sundown system is 6 inches mounting depth and recommended ported enclosure is 1.25 cubic feet. Remember I wanted fiberglass. I only have $12,000 to spend on this. What also worries me is the fact that on online forums usually 1400w rms requires an alternator change or at least so they say. This would be beyond my budget. (1) Alpine PDX-V9 5 channel (4x100 + 1x500) amp. (1) Alpine Type R 10 inch Subwoofer. I not too sure how that will sound. I fear I may not feel the bass with only 500 watts. I not sure about it. I want advice please on what I should do. I'm open to different sound system ideas and even better if someone's willing to professionally do it. 1st of all will your warranty be void by toyota if you add a sound system. SR wrote: 1st of all will your warranty be void by toyota if you add a sound system. Sales rep said that it wouldnt void the warranty as long as the alternator remains original. Plus we usually service the vehicle ourselves, like to know what going on with the vehicle ourselves. The difference between 500W to the subs and 1100W to the sub is about 3.4 dB. That's not going to be all that noticeable IRL. FWIW, I've got an Alpine PDX M12 and a PDX F6 installed for a grand total of 1.8kW RMS and my Hyundai Tucson is still running its stock alternator, and this is an install that was done several years ago. Unless you're deaf, you're not going to be running the system at its peak power output. Your car is likely capable of doing over 100MPH, but I'll bet you won't be driving all the time at that speed either . Having said that, I will say though that I'm running 2 12s sealed, not 1 10 vented, so the power I need to reach a particular SPL level would be a lot less than the build that you're considering. My system basically idles for most of its use. I wouldn't base my design around a 1 ohm load for the bass unless I was a bass-head, and if I was a bass-head, I won't be settling for one 10, LOL. Consider a design around a 2 ohm or 4 ohm load instead. Honestly, if I had to choose between your two options above, I'd first listen to how those Focal components sound compared to the Alpines - because those are going to account for ~80% of the music spectrum - and base my decision on that. Brian Steele wrote: The difference between 500W to the subs and 1100W to the sub is about 3.4 dB. That's not going to be all that noticeable IRL. Maybe I could go with Hifonics Brutus 5 channel 1200 watt then. The sales rep at toyota recommended that one. He said run the focals 60 watts at 4 ohms and the subwoofer 750 watts at 2ohms. Story does change with reps..
Heard warranty void if deck changed already. Hifonics nowhere in alpine league. Go for a smaller alpine 5 channel. Or a pair of jbl msa amps. Can vouch for those and the alpine pdx. Rips is a plus. Jl 5ch has rips also. nervewrecker wrote: Story does change with reps.. Brand new Rav4 comes with a choice of two decks. A dvd deck or an alpine cd bluetooth double din deck. My sales rep is the one who in charge of contacting safe and sound solutions to install those decks. So he told me my safe limit for the alternator is 1200 watts. Careful when you go back you hear warranty void. Wont hurt to ask another rep.
Current draw to 1200 watts varies from amp to amp. Just letting you know up front. nervewrecker wrote: Careful when you go back you hear warranty void. Wont hurt to ask another rep. If warranty void, the only way that hurts me is if the car write off because we do all tge servicing of the vehicle ourselves at my neighbour. He cane from England. He used to work at the BMW assembly plant. He services my car for me regularly or we service the car ourselves too using Toyota Genuine Parts though. He not feeling well. Give him a call in about a week or two. This virus is a hell of a thing. Have real men feeling mash up. focal mids and highs with a JL HD 900/5 would be decent. Have heard a similar setup on a toyota fielder. clean as heck. I NOT SURE if the Sundown SA-10 Rev 2 would fit in a fiberglass enclosure in the 2016 RAV4. Anybody have any experience with a rav4 think it would? Ported Enclosure Recommendation - 1.25 cubic feet. I more leaning toward your last resort system as the more viable option for a space saving install. That alpine sub can get pretty loud in a sealed enclosure far less for ported. That alpine V9 is one of my favorite aswell. kavaninho wrote: I more leaning toward your last resort system as the more viable option for a space saving install. That alpine sub can get pretty loud in a sealed enclosure far less for ported. That alpine V9 is one of my favorite aswell. I was also thinking of the new sundown sd3-12. The sd-3 12 has a mounting depth of only 5 inches and there are no vents to the back of the woofer meaning it was tested with the magnet against the back wall in a 0.5 cubic feet sealed enclosure. Focal Access coaxials and components. That's because I really not sure how alpine type r components and coaxials sound. Not sure. kavaninho wrote: The sd-3 12 has a mounting depth of only 5 inches and there are no vents to the back of the woofer meaning it was tested with the magnet against the back wall in a 0.5 cubic feet sealed enclosure. Hmm.. The SD3 10" and 12" drivers have a rated Xmax of 14.5mm. The Type-R drivers (10" and 12") have a rated Xmax of 21mm. On paper the Type-Rs will provide superior output (more bass and less distortion). However, at only 1kW RMS into a 12" driver presenting a 2 ohm load in a 0.5 cu.ft. box, I doubt that the resulting excursion requirements would be as high as 14mm, much less 21mm. The Alpines do offer the advantage though that you can use them in a larger sealed box, which will provide more low frequency output and require less power to do so. But the SD3 series can only handle 500-650W rms though at 1 or 2 or 4 ohms. Type r handles 1kw so leaves room for upgrades in the future. Why not stick with safe and sound for the install as well?? That way no warranty issues can come up about the electronics in the vehicle.